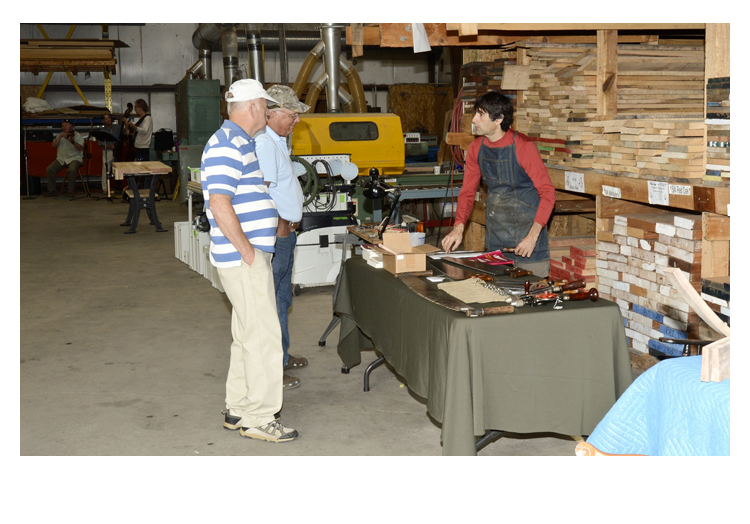 Let me start off by saying thank you to everyone who stopped by my bench at the Hearne Hardwoods open house. This was my second year going and I tried to be a little better prepared and brought tools to sell as well as a kit for those of you with questions about filing. Being my second year I had a better idea what to bring and how to set up. I also expanded my time and went both Friday and Saturday after talking with Mario and Allen of Philadelphia Furniture Workshop who felt Friday was the busier day. Getting there on Friday prior to the opening also allowed me to set up and walk around a little. For those of you outside the area or just haven’t had the time to visit Hearne, driving up it looks like most lumber yards with a large pole building but after a short walk around and side said building you quickly realize the amount and selection of flitch & log sets they have. For those of you that did stop by and talk, a few of us talked about a hardware store saw for “Chandler & Barber” that I was filing as time permitted. At the time I hadn’t had time to look into the hardware store. As it turned out, Chandler & Barber was one of the largest and well know hardware stores in the Boston area. Hardware was their back-bone, but like Sear and Woolworths, they branched out over the years. Owners Alexander Chandler, editor of Hardware Record Magazine , and D. Fletcher Barber owned and operated the hardware company located at 122-124 Summer Street in Boston during the mid-1800’s through the 1920s. The manufacturing of these saws would have been contracted by one of the larger saw manufacturers and looking the saw over I would say Disston or C.E. Jennings. Before signing off, I also want to thank the many of you that have sent me saws for sharpening. Saws, for the time being, have become a large part of my income and I appreciate the new and repeat business. For those of you who follow me in ebay, you will have noticed I’ve switched over most of my saws to buy it now. I’ve done this for a few reasons, the main one being it’s just the fairest way to do business for both me and the future owner. No shill bidding for buyers to worry about and I can get a fair price for the work done. Plus for those who feel the price is high I’m always willing to take offers. For those of you looking for the best deal I normally sell the same saws on my personal site at a slightly lower then ebay price. I do this as my site saves me the MANY ebay fees and I pass it on. Rest assured I’ll always keep a few saws on auctions for the diehards. Joe FedericiA fool for fall! Another tool season, like summer, is coming to a close. But here in the northeast, September treats us to many warm days and cool nights perfect out door activities and my favorite time of the year. September starts with my annual trip to the Gauly river. A few weeks later I’m off to MJD’s auction in NH. 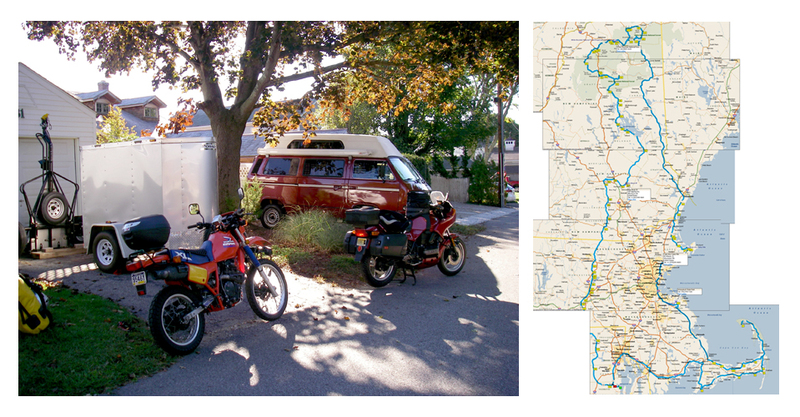 I have a little more time on my hands, so after the show I met up with a friend and we spent a week on the motorbikes camping and riding through RI, MASS and NH. But enough about that as most of you are saw guys like me! It would seem we have the lustrous and larger then life Patrick Leach to thank for an ever earlier and earlier arrival of the buyers and seller. So with that in mind, I arrived Wednesday and found tables all ready as I back the van into my usual spot. The pickings in the fall are always a little lighter then spring but I wrangled a few nice saws and picked up a really nice craftsman built saw vise perfect for full size saws. Something I hadn’t come across in the past. Then I found another one the following day! The second being of furniture quality and quickly found a home with my friend and deft tool repair craftsman John Porritt. John, being a life long artisan and trained cabinet maker, has a great knowledge of early joinery and being a fellow saw lover he fancied the vise and somehow it followed him home but not before a great discussion on all things woods and the history behind “yew” wood used in English and Welsh longbows and the reason it is found in churches. All very cool, note to self: plant some around the shop before the next siege! Friday’s auction, often called “the dealer auction”, wasn’t heavy in saws but did offer a lot of great items that I’m sure have found their way into the hands of many of you. I’m, however, more of a lot lizard and enjoy trolling the yard, digging and conversing with others. Those of you that know me, keeping my mouth shut while sitting through an auction is torturous. So back out in the parking lot, but not before I grabbed a few napkins (for drive) I walked over to Don Rosebrook’s amazing collection of near mint saws and saw accessories. It’s a real treat just seeing so many pristine examples of saws Don has collected over the last 10+ years. This year he brought some interesting sales displays, one being a large Disston sign in the shape of a D8 rip saw. The handles was cast and I’d say it weighed over 20 lbs. Far outside my price range but just awesome to see. The saw used was from around the glover patent when the medallions were still sunken. I personally think those are the nicest years. This year I also brought some saws and a few other odds and ends to sell. Mostly straight warranted superior saws that would make good users that I had picked up the year before in box lots. Changing gears and selling was fun and I enjoyed talking and meeting locals who came Saturday to walk around the parking lot. Saturday is also the main sale for most of the collectors and larger buyers. Prices seemed to be good and that was nice for all of us who resale. I finished packing up my things in the AM and made plans to travel back towards Boston to meet up with a friend and now customer Freddy Roman. I had met Freddy the prior year through Josh Clark. Freddy makes reproduction and custom designed period furniture. I’m sorry to say I just didn’t think of taking my camera with me into Freddy studio. The minute I got back onto the expressway I smacked my head. Regardless, check out his site. The shop was filled with projects in various stages of completion. Freddy had contacted me about buying a rip saw plus having me look over and sharpen a few of his saws. Before leaving he followed me back to the van to check out my latest finds. The gentleman packing up next me gave me a Disston meat saw that hadn’t sold and I exchanged for a saw in my inventory. Freddy took a shine to it, so I was more than happy to pass it on to a new home. Meat saws have never held much interest to me unless it’s a maker I fancy. The business portion of the trip concluded, I checked in my friend Bob Mac and set an ETA for meeting up. Having spent a few days in the van and now switching gears to the bike required gathering my previously gathered, but yet to be packed clothing and gear for the next week, then fitting into and on the bike. This being the second time in the last few months we’ve bike camped, we both have our preferred kit. Once together we discussed routes and figured out our general daily route then printed up a trip tick of sorts and a tank map. Route set, we finished loading gear and a final check of the weather. I won’t bore you with the finer details of the day to day and just say it was great time and the weather was better then I had ever hoped. I’m am an avid camper so for those interested would happy recommend any of the sites we camped at if you’re traveling in those areas. By far the two nicest were also close to each other. In the past, most of my time sight seeing and camping in NH has been around the Whites, but the lakes and surrounding area of Winnipesaukee were spectacular. Pawtuckaway and Bear Brook State Parks both offered some of the best views and cleanest campgrounds I’ve been at in recent memory. I’m sure this being off peak times played a big part, but just the same, if you’re in the area they are worth checking out. I’ve listed them in the order we camped and corresponding to the map pictured above. The time we spent in North Conway and around the whites is always majestic, and it was nice taking the road up mount Washington as thus far it’s always been on foot. The k bike also enjoyed a few roads less traveled and handled the 15 or so miles of dirt as if it were a dual sports. With that I’ll say cheers till the next post. Last weekend was the open house at Hearne Hardwoods and I want to thank everyone who stopped by and double to those that bought a saw or other item. More to come on that with next post.